Hiking in Israel is a real treat: the country offers hikers an abundance of incredible hiking trails, ranging from green hills and refreshing rivers to majestic canyons and awe-inspiring deserts. You could spend weeks or even months hiking the unique landscapes of Israel, but as you’re probably short of time, we’ve outlined some of the most popular Israel hiking trails for you. So grab yourself an Israel hiking map and start exploring the best hikes in Israel! 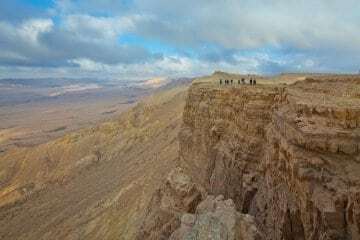 The Masada Israel Hike is one of the most famous hikes in the country. The snake path (which owes its name to its winding trajectory) starts at the base of the steep cliff upon which lies the ancient fortress of Masada. It climbs up 400 meters, offering stunning views of the Dead Sea, the desert, and the Jordanian Mountains. The recommended time of day to do the Masada hike is at sunrise: a Masada sunrise is truly unforgettable. It takes about 60-90 minutes to complete. The Ein Gedi Nature Reserve is a spectacular oasis in the Judean Desert, lying on the western coast of the Dead Sea. It offers 9 hiking trails in varying degrees of difficulty, the most popular of which are located at Nahal David and feature pools, springs, caves and waterfalls surrounded by golden cliffs and desert. The lower section of the trail is a circular, 1-hour walk which starts at the ticket office and ends at the mesmerizing David’s waterfall. The upper section, which is more challenging and takes 3-4 hours to complete, picks up from Nahal David and goes on to beautiful spots like Dodim’s Cave and the Ein Gedi Spring. A thrilling opportunity of hiking in the desert is Nahal Dragot, near the Dead Sea. The challenging hike starts at Metzoke Dragot, 50 meter high cliffs, and then takes you through the dry river Darga, a deep, rocky canyon abundant with freshwater pools. The hike requires holding on to the metal stakes in the rocks and occasionally using a rope. However, there are also some easier routes on this trail that don’t go all the way down. It takes between 8-9 hours to complete. At the northernmost part of Israel, the Golan Heights offer tall mountains covered in lush greenery, bubbling streams and rich wildlife. The trail starts near Mount Hermon, Israel’s tallest mountain, and winds south through kibbutzim and Druze villages, the Gamla Nature Reserve (known for its population of vultures), all the way down to the Sea of Galilee. The whole trail takes about one week to complete. This short trail (3.5 hours long) gives you an opportunity to explore an area known for both its history and rugged natural beauty. It was originally built as a bypass road by Israeli soldiers during the War of Independence, when the Jordanians were blocking the main road to Jerusalem. The trail has an eastern and a western section, both of which follow the Israel National Trail at parts. The western part goes in the direction of Latrun through Park Rabin, a lovely pine forest. The eastern part climbs up to the village of Beit Meir, where you can choose to go back down to the Martyrs’ Forest or follow the road toward Jerusalem. We hope you enjoy your hike! Don’t forget to prepare in advance and taking all the necessary safety measures.